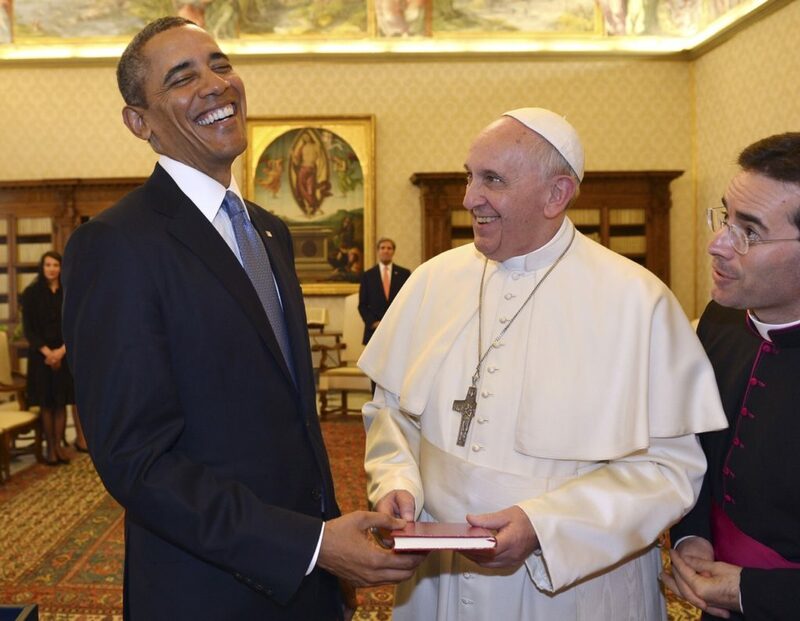 Pope Francis and President Barack Obama smile as they exchange gifts, at the Vatican Thursday, March 27, 2014. President Barack Obama called himself a “great admirer” of Pope Francis whom he considers a kindred spirit on issues of economic inequality, immigration and so many more global concerns essential for the well being of God’s people. Here is a salute to one of the finest American presidents ever elected by the people to serve this United States of America. AD Multos Annos! Looking back on these last few years of the ministry of Pope Francis to the Church and the World we give thanks for his example of universal and all inclusive ministry of mercy, kindness and largeness of spirit, never narrow minded, partial or bigoted. May we walk with these two great men into the future in solidarity with all God’s people especially with those most in need.